[We originally posted this article in 2012. In 2017, we are finding this a good time to revisit it, and Chris Mahin brought it up to date. Chris wrote: “January 28 marks the anniversary of a great tragedy in 1948 which inspired an eloquent plea for justice for undocumented immigrant workers . . . below is an article that I wrote about the plane crash at Los Gatos, California for a union website. The article was written several years ago. I have revised it slightly, but its message is needed today more than ever. Feel free to share it with anyone you think might be interested in seeing it.” This article is adapted from an essay written on the 60th anniversary of the plane wreck that inspired Woody Guthrie’s immortal song]. Trio; Cisco Houston; Judy Collins; The Byrds; Joan Baez; Arlo Guthrie; Sweet Honey in the Rock; Hoyt Axton; Peter, Paul, and Mary; Roy Brown Ramirez, Tito Auger and Tao Rodriguez-Seeger; and Paddy Reilly, among others. The great labor leader Mother Jones once said that we should mourn for the dead and fight like hell for the living. On this 69th anniversary of a terrible loss, we should pay special heed to the appeal for the unity of all workers which rings out so beautifully from Woody Guthrie’s song. Today, we can honor the dead of January 28, 1948 best by speaking up in defense of the living immigrant workers of today – regardless of documentation status — and by demanding that the rulers of this country cease their cowardly attempts to use the immigration issue as a wedge to divide the workers of this country. • Joe Peery: Founding member of the Chicago Gary Area Union of The Homeless in 1986. Led effort to fill public housing’s empty units with homeless during the 1980s and 1990s. Formerly a Youth Organizer in Cabrini Green. 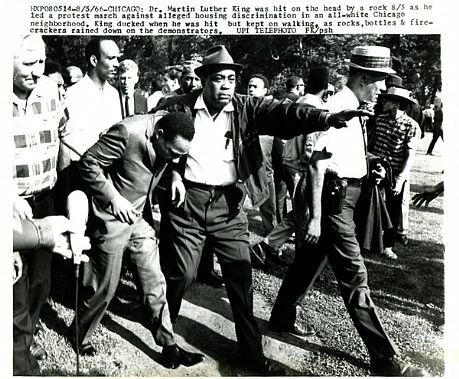 Former resident of Cabrini Green. Currently a reporter for the People’s Tribune. Currently a resident in the mixed income housing that was built to replace Cabrini Green and fighting the unequal apartheid like treatment of CHA residents residing there. Dinnerluck/potluck precedes program, which begins at 7:30 sharp, Mess Hall, 6932 N Glenwood just south of Morse. Presented by Occupy Rogers Park, in conjunction with Mess Hall. Thank you for following our achievments throughout the year. I am Chris Drew, the volunteer Executive Director of the Uptown Multi-Cultural Art Center for the past 24 years. I work for you without pay. Our ground breaking lawsuit against the Chicago peddlers license is soon to be filed. The stakes are high. Your help is needed to make Chicago more friendly to artists. Cindy is not her name but her story is common in Chicago. She is an artist facing poverty, out of a job, prolific, but unable to sell her art in public. Even with a peddlers license her opportunities are limited because there are no art scenes where she is able to sell her art. When she ventures out, she finds herself confused by the public with the homeless who they are used to seeing on the streets of Chicago. The homeless have won their First Amendment rights to meet the public in Chicago while artists have not. In the few marginalized areas of Chicago where the peddlers license allows her to sell, she is not joined by other artists in a vibrant street arts scene. The public sees her as a lone figure against a bleak cityscape and pass on by. She is unable to survive, as she should, by her art in Chicago because street art culture has been killed by unfriendly laws and prohibitive park policies. Remember Lee Godie – the lady who became famous selling her art in front of the Art Institute? Chicago outlawed her activity the year she died, 1994, by requiring a peddlers license that defined the sidewalk before the Art Institute and most of the best locations in Chicago as prohibited areas. There have been few, if any, artists legally surviving by selling their art in public in Chicago since that time. Chicago’s cultural character is largely hidden. We envision a future art Mecca of street art scenes showcasing Chicago artists in public with myriad opportunities for artists to survive by their creative activities. Chicago’s streets should bloom with art and culture every spring. How badly do we need change? When I tried to challenge the constitutionality of this peddlers license law by selling art for $1 in public the State attempted to put me in prison for up to 15 years using the unconstitutional Illinois eavesdropping law. I didn’t back down. In Illinois we don’t have the right to gather the evidence of what police say to us in public to defend ourselves in court. My actions are resulting in a move to change this law in Springfield this year that will bring Illinois in line with the rest of America allowing you to audio-record your police in public in Illinois. We are creating change with pure guts. We are winning real freedoms for you. Now we are also going forward with our lawsuit to increase artists’ rights to sell art in public, as we originally intended. Court decisions on how to define the art which is protected by the First Amendment when it comes to the sale of art in public. We have gathered scholastic arguments for a new way for the courts to determine what art is protected. Throughout all this turmoil of legal battles over your rights we have continued to conduct our free Screen Print Workshop for Artists. 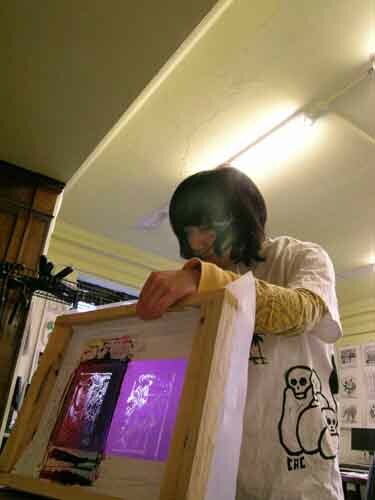 This workshop teaches artists the basics of screen printing using the least expensive and least technical methods providing them with another tool to better survive by their art. Our Art Patch Project to educate Chicago on artists rights is an on-going growing exhibit of art printed on cotton patches. We print the designs submitted to us by artists supporting our fight for their right to sell art in public and give them away to the public. Exhibits of this growing body of artwork are being prepared to travel around Chicago and other cities to increase the awareness of our movement. These two effective community art programs are a solid basis for the creative change we are engaged in. They deserve your support all by themselves. Stay tuned for more details in our fight to support greater freedoms for everyone and artists in the new year. Support our pioneering efforts at changing Chicago and America to make them more friendly to artists in the future. Donate to the Uptown Multi-Cultural Art Center. We are a most effective, all volunteer arts non-profit making change by supporting and promoting the art and artists of our communities. Make a tax deductible donation now. Change Chicago and Illinois. The freedoms we fight for belong to you. This is Danny Alexander’s sum up of the year, his Occupation as a music writer and political thinker. I hate making year end lists. I’m a slow listener, for starters. And other than superficial run-ins with the radio, I tend to listen to one thing at a time. Once I get into some music enough to write about it, I don’t look up much until the writing’s done. 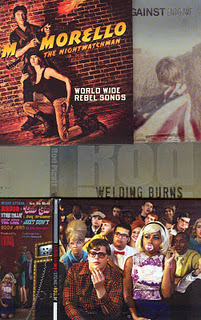 I reviewed about 22 albums in 2011. Since my I-Tunes lists about 22 new album releases a month, I’ve deeply listened to (and this is being wildly generous to myself) at most 1/12th of the music high profile enough for a (let’s call it) national conversation about the state of our music. Since about half of what I’ve listened to is regional and not likely to be listed in I-Tunes new releases, it’s safe to guess I’m listening to less than 1/24 of what we might talk about in a year-end review. So, while I’m sometimes asked to do those things, I’ve never seen it as a gauge of what mattered most that year. It’s what mattered most to me, which is, at best, an argument for the importance of some things others might have overlooked or undervalued.